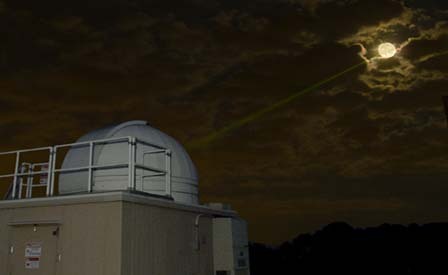 Satellite Laser Ranging (SLR) and Lunar Laser Ranging (LLR) use short-pulse lasers and state-of-the-art optical receivers and timing electronics to measure the two-way time of flight (and hence distance) from ground stations to retroreflector arrays on Earth orbiting satellites and the Moon. Scientific products derived using SLR and LLR data include precise geocentric positions and motions of ground stations, satellite orbits, components of Earth’s gravity field and their temporal variations, Earth Orientation Parameters (EOP), precise lunar ephemerides and information about the internal structure of the Moon. Laser ranging systems are already measuring the one-way distance to remote optical receivers in space and can perform very accurate time transfer between sites far apart. Laser ranging activities are organized under the International Laser Ranging Service (ILRS) which provides global satellite and lunar laser ranging data and their derived data products to support research in geodesy, geophysics, Lunar science, and fundamental constants. This includes data products that are fundamental to the International Terrestrial Reference Frame (ITRF), which is established and maintained by the International Earth Rotation and Reference Systems Service (IERS). The ILRS develops the necessary global standards/specifications for laser ranging activities and encourages international adherence to its conventions. ILRS Governing Board for the 2019-2020 termRelease Date: 02/11/2019 The ILRS Governing Board is pleased to announce that the election of the two Board-appointed members to the ILRS Governing Board has been completed. We were fortunate to have had many qualified candidates participate in the election process. The members of the ILRS Governing Board have elected Ulli Schreiber (Technische Universität München) and Krzysztof Sośnica (Wrocław University of Environmental and Life Sciences) to these two positions. Once again, congratulations to the newly-elected representatives and thank you to all the excellent candidates who participated in the ILRS Governing Board elections. New guidelines for missions seeking ILRS support for SLR trackingRelease Date: 02/04/2019 The ILRS Missions Standing Committee (MSC) and Governing Board have recently approved new guidelines for missions seeking ILRS support for SLR tracking. Mission contacts should consult the "Guidelines for Submitting an ILRS New Mission Support Request" documentation prior to submitting a completed ILRS Missions Support Request to the ILRS Central Bureau. Proceedings website for the 21st International Workshop on Laser Ranging now availableRelease Date: 11/27/2018 The proceedings website for the 21st International Workshop on Laser Ranging, held November 05-09 in Canberra Australia is now available with links to presentations, posters, and papers. Summary information is also available at the website.